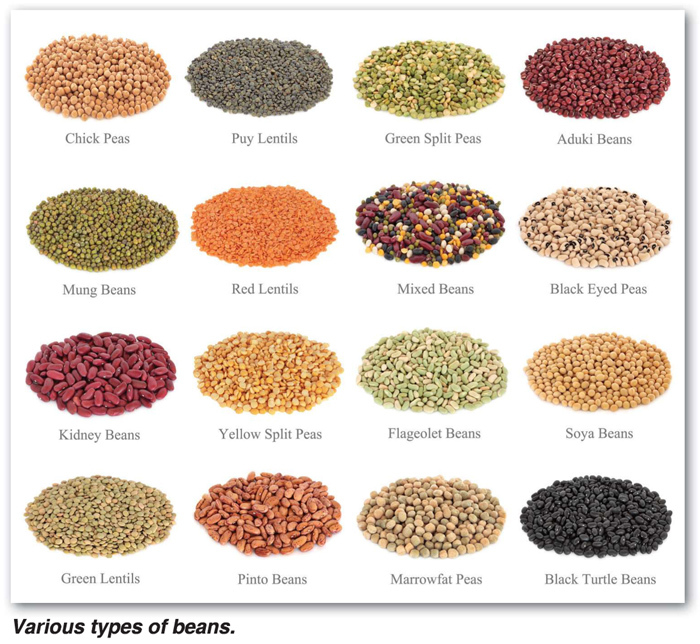 The dry seeds of the eleven types of edible bean types grown worldwide, from within the whole legume family of plants, produced commercially or for own and family use are known as pulses. The word ‘pulse’ specifically refers to the dry seeds produced which can be harvested by hand or machine and packaged and cooked in various ways or stored for long periods as dry seeds and the plants which produce such seeds. Storage can be in bulk facilities, bags, and small packets as well as processed into canned beans in brine or tomato sauces and many other ways. We are all familiar with these products on supermarket shelves or found at Spaza’s and street corner traders. Fresh beans, peas, soybeans and peanuts are not considered to be pulses. Soybeans and peanuts will thus not be considered in this article. Soybeans and peanut seeds are much higher in fat content whereas pulses contain virtually no fat. The more well-known pulses include the following bean types: Red speckled, brown haricot, large and small whites. Other major pulse crops include dry peas, lentils, chickpeas, carioca beans, alubia beans, pigeon peas, faba beans, dried split peas, mung beans, black eyed peas, lupines, bambara beans and cowpeas. Dry beans are a very healthy food source containing no cholesterol, are rich in amino acids such as niacin and thiamine, iron and other nutrients for normal growth and body tissue growth. Pulses have a very high protein and fibre content and are low in fat and are a very good addition to infant and younger people’s diets. The fibre slows down the absorption of carbohydrates and so provides slow burning energy over a longer period which helps people with diabetes suffering from insulin resistance to reduce the high fluctuations in blood sugar levels which are a problem. Red speckled sugar beans contain about 74% of carbohydrates, 3% fat and 23% protein on analysis. One cup of cooked beans or two-thirds of a can provides nearly half the recommended intake of fibre of 21 g to 25 g per day for adult woman. Adult men need 30 g to 38 g of fibre to function effectively. Meat contains no fibre. As a small producer, you could start with growing from a 0,5 ha of red speckled dry beans through 1, 2 ha or 5 ha, up to 10 ha’s. From the discussion one can see that there are many advantages in producing dry beans from a basic level to ensure food security to building production over time to exceed self sufficiency needs. With experience and enough financial inputs one can become a fully-fledged commercial producer supplying wholesalers in the market or ultimately packaging beans and selling them directly to consumers. South Africa imports about 85,000 tons of beans per year in addition to the national crop ranging from 44,100 to 82,000 tons a year. There is still a huge local market to be supplied. The farm gate value for good grades of beans is between R12 000 and R14 000 per ton if sold to merchants that clean, pack and remarket the seed. Farmers can usually average between 1,8 tons/ha and 2,2 tons/ha of saleable seed with good dryland production practices. This implies a gross income of about R26 000 per hectare which compares very well with the income from other dryland crop production options. Most recommendations for a desired viable plant population require about 75 kilograms of seed per hectare. The cost per 25 kg of quality bean seed for planting is in the range R1 200 to R1 450 per bag from recognised seed supply companies. Your seed cost/ha could be from R3 600/ha to R4 350/ha. All the other direct input costs should be added to this. The finances and other production resources available will determine which sized area from 0,5 ha to 10 ha would be most suitable to plant. At the consumer end of the chain 1 kg of packaged beans retails for about R22,00 per kg for 500 g packets to various sized packets making up 5 kg packs. This gives an implied value of R22 000/ton at his point. There is therefore quite a leeway for adding value at various stages of trade in the chain from farm to consumer. 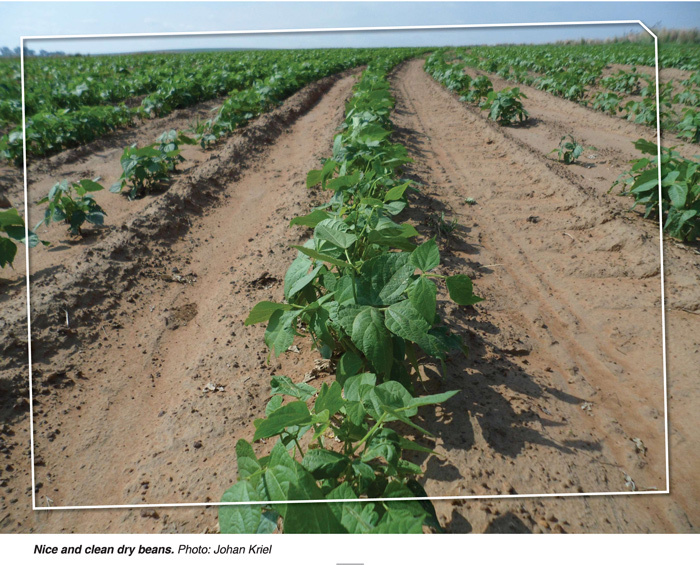 Experience from growers and seed suppliers indicates that beans should be planted on a well-prepared clean seed bed when soil temperatures are over 13° and with a prevailing seasonal temperature of between 18° and 20°. A sandy loam, sandy clay loam or clay loam soil with a clay content of between 15% and 35% are all suitable. Farmers using conservation tilage methods should be careful that there is not too much plant residue present on the soil from the previous crop. The seed needs to be planted in moist conditions for maximum emergence and a good final plant population. This factor is critical as the seed costs to plant are a high proportion of the total direct costs. Although beans are a legume and fix nitrogen farmers should fertilise the crop with nitrogen, assuming that the crop will not provide any nitrogen itself. Use a soil analysis to optimise the nutrients required. Beans can play an important role and is a high value option to be brought into a crop rotation plan. Experience shows that it seems best to follow maize in a rotation and should only be planted on the same land every three years. Sorghum could also be used with maize within the rotation but due to the possible build-up of Sclerotinia it is recommended that sunflowers not be included in the rotation with dry beans. Where the production of wheat is viable, or the planting of green feed is required for your livestock these can also be used to an advantage in the crop rotation plan. The growing of dry beans should be strongly considered as an option for both small and large growers, given the high value of the crop compared with other dryland and irrigated crop options at the current prevailing Safex futures prices. It can be used as a useful crop within a planned rotation system. Article submitted by a retired farmer.